Many rheumatic disorders and other conditions accompany the clinical feature of puffy fingers. This sign is mainly observed in the early stage of these disorders. The most representative disease of puffy fingers is systemic sclerosis (SSc). 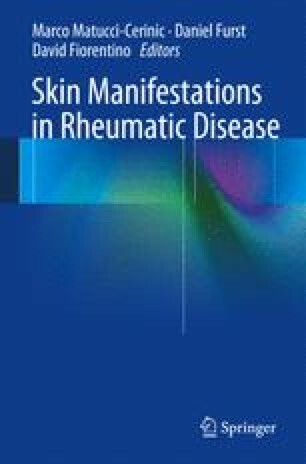 In many cases of limited cutaneous SSc (lcSSc), Raynaud’s phenomenon, puffy fingers, SSc abnormal capillaroscopic pattern, and SSc-specific antinuclear antibodies precede skin sclerosis. Among SSc-specific antinuclear antibodies, anticentromere antibody (ACA) is most frequently observed in early lcSSc. In addition, anti-Th/To antibody is well known as a serological marker of SSc sine scleroderma patients who exhibit only puffy fingers without a tendency to exhibit sclerodactyly. Anti-u1 RNP antibody is also detected in the patients with “mixed connective tissue disease (MCTD)” or “undifferentiated connective tissue syndrome (UCTS)” who exhibit puffy fingers. In the category of dermatomyositis, the patients with anti-aminoacyl-tRNA synthetase antibody syndrome (ARS syndrome) also exhibit Raynaud’s phenomenon and puffy fingers. Moreover, puffy fingers can be observed in early rheumatoid arthritis (RA), SSc-like disorders, overlapping syndromes, erythema pernio, and other conditions including thyroiditis/hypothyroidism, acromegalia, and primary Raynaud’s disease. Thus, for differential diagnosis of puffy fingers, careful clinical observation and serological investigation are very important.